Project details for classes in 2019 are almost ready! Beginning in February, each Saturday of the month will focus on a “theme”. In Upcycle/Recycle projects could be turning jeans into a bag or quilt, creating a lovely pillow from Grandmother's hankies, or a tablecloth can become a darling summer top. Perhaps you have saved your child's T-shirts? 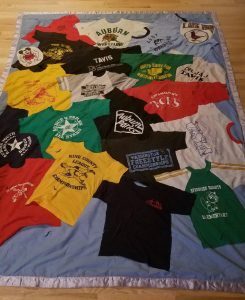 They can be a wonderful "memory" quilt! 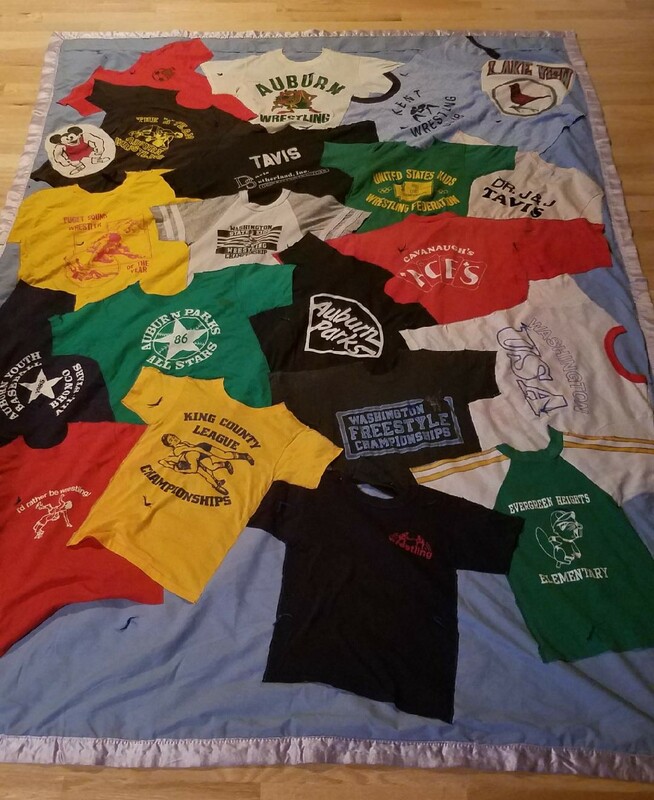 My son's T-shirt quilt, made in early 90's! Heirloom Sewing projects can be home decor embellished with lace, pillows with Swiss insertion, or a darling dress for Easter. Multi-generations is for mothers and daughters, grandmothers and granddaughters, mother/son, father/daughter . . . you get the idea! Work on a project together or separately. All levels of experience welcome! Let’s Play with our Feet! Using a variety of pressure feet, students will learn about their machines and create fun projects at the same time! The fourth Thursday of each month (except holidays), from 6-9 pm, is the “Sewing 4 Others” session. 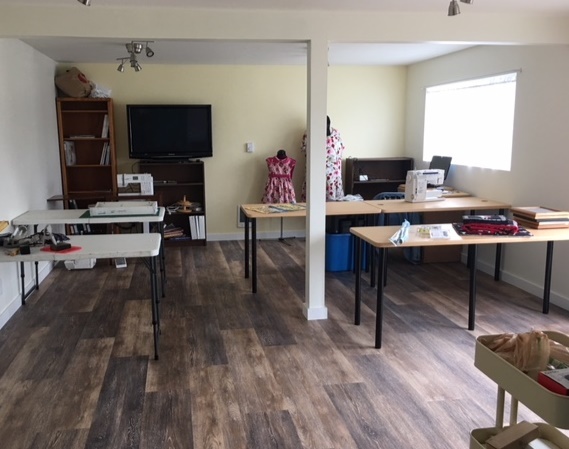 Anyone who would like to sew for others may meet at my location in Enumclaw. Bring a friend, or make new ones, while sewing for the benefit of those less fortunate. Classes will be listed on the Calendar soon and details for specific projects will be on the Classes page. On occasion, the project will be a "SURPRISE"! Other weekday and evening sessions are by appointment. 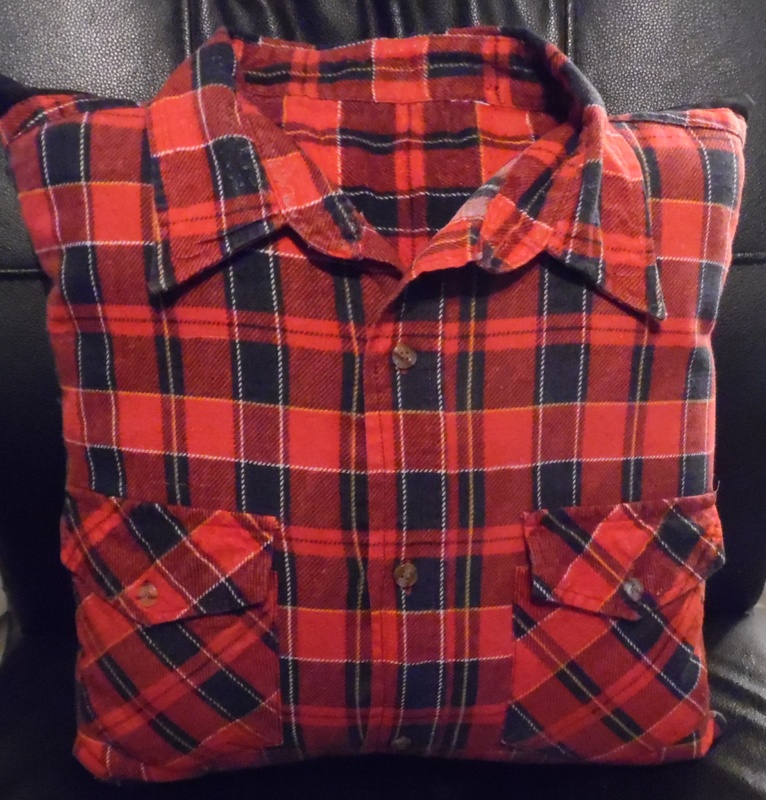 A nice, sentimental gift is a "Memory Pillow" created from the shirt of a loved one. Made with quality materials, the pillow will be *hugable* for years to come! The name and dates plus a saying or favorite verse are embroidered on the back. There are still openings for this Saturday, November 10th. Don Jensen of “Affordable Sewing Machine Service” will be here to demonstrate proper procedures on maintenance and service of your sewing machine. Bring your machine for cleaning and bring a list any problems you may be experiencing. Supplies Don would like you to bring: a soft towel, two bobbins with colored thread (not white or black) and a contrasting color spool of thread, any type of magnifier you might need, and you should be able to thread a needle. Don't forget the foot pedal or power cord! The class will be from 10-1 pm; fee of $10 each. Please call, email or register online. I have lots of great items ready for my booth at The Festival of Crafts and Gifts November 16th-18th at the Enumclaw Expo Center. There will be two “Make & Take” projects: the first is a simple, fun eyeglass case; the second is “yet to be determined”! I am still working on the details for that one. All machines and supplies will be provided ($4 fee). There will be lots of booths, fun, music, food, and of course ~ Santa! Visit their website for details. The "Sewing 4 Others" session for November and December are cancelled. Enjoy Thanksgiving with your families! The shop will be closed between Christmas and New Years and no classes scheduled. Continue to check my website for fun and exciting classes in 2019! Website and Email Issues! Upcoming Events! I want to apologize to anyone who tried to access my website or sent an email recently. My site was down for a few days but is now up and running! 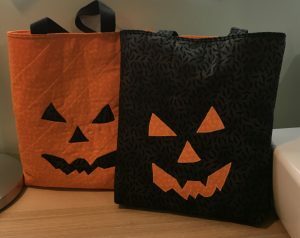 There is still time to make a darling Halloween treat bag! Register on my website or contact me directly (253-318-1414 or sales@old2newheirlooms.com) to shedule a class. This is a simple but fun project for all ages! The October "Sewing 4 Others" session is this Thursday (6-9 pm). Kennel blankets are a fun project, or fleece blankets for the homeless, maybe? The "Mama Mia Bag" class will be an all-day class on November 9th. 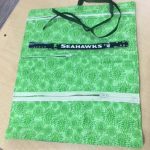 Visit Pacific Fabrics Bellevue for details and registration. I will have a booth at The Festival of Crafts and Gifts November 16th-18th at the Enumclaw Expo Center. Lots of booths, fun, music, food, and of course ~ Santa! Check out their website for details. October Projects, Upcoming Events & Holidays! Fall schedules are filling up! Mark your calendars for two fun projects in October: a simple Lap Throw or Wall Hanging and a cute appliqued Halloween Treat Bag. Of course, there are a multitude of alternative projects to choose from! 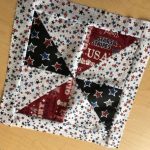 Perhaps you would prefer to create a handy tote bag with lots of pockets, a holiday apron, or a quilt block pillow. Select a day and time for your class and register online. Don’t forget about the fourth Thursday of each month (except holidays) for the “Sewing 4 Others” session (6-9 pm). There will not be a fee. 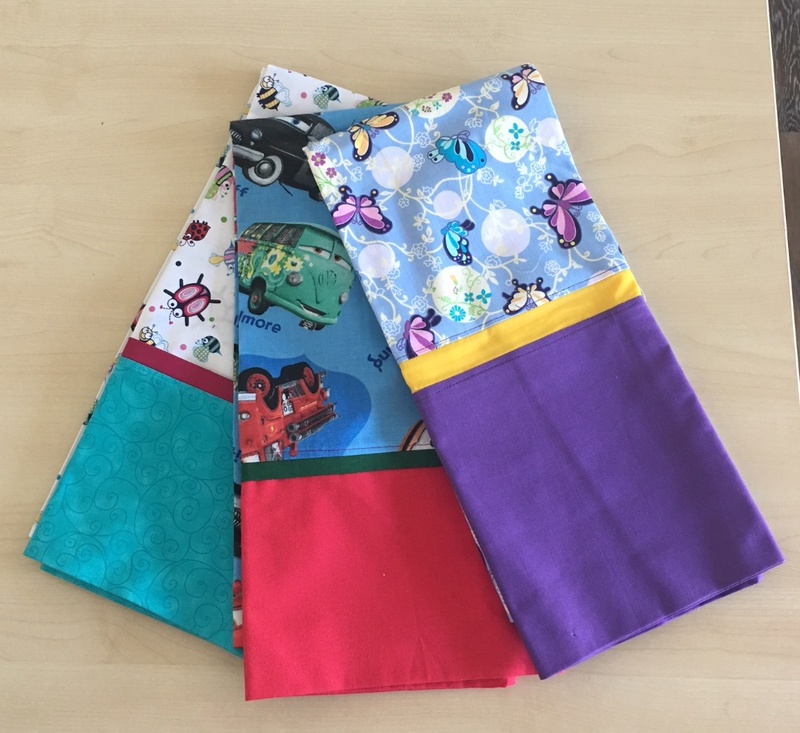 I have a range of projects in mind: blankets or knit gowns for NICU’s or the PIC in Kent, quilts, pillowcases for foster kids, or blessing bags ~ for starters. Suggestions are welcome, too! If there are requirements or restrictions for a specific project, I will have those available. You may bring your own fabrics and there will be a selection available here. As space is limited call, email or register online. 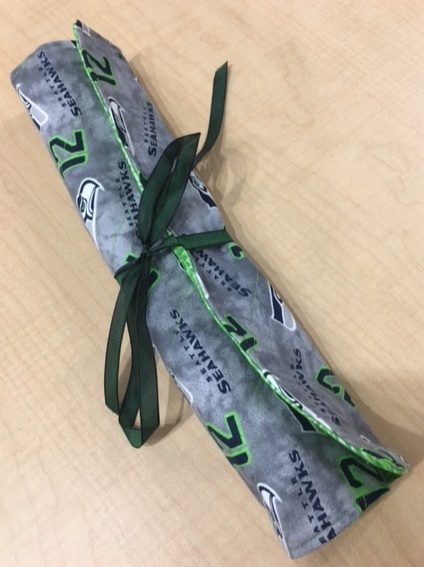 October 19th I will be presenting a class, “Change It Up Table Runner”, at the Pacific Fabrics Bellevue store. 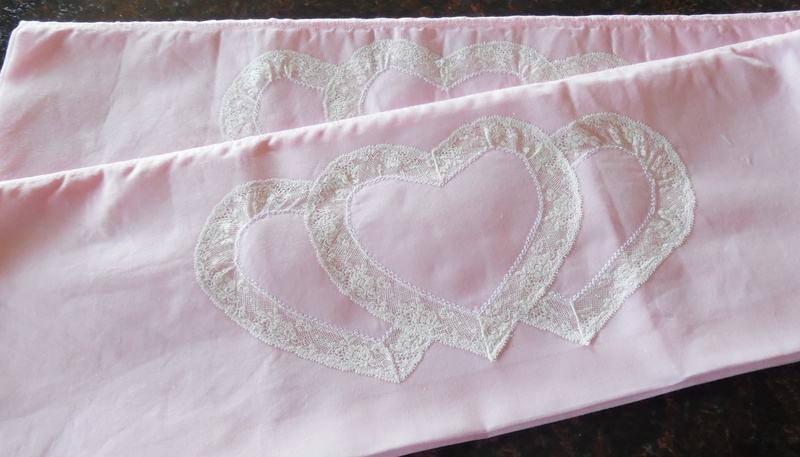 This table runner will make paper plates look dressed-up and show off even the most elegant of table decorations. The heirloom Madeira technique is used to create the frame and decorative stitching or embroidery accents the insert. Seasonal fabrics or colors to match your place settings may be selected for the insert. Visit Pacific Fabrics (Select Classes and Bellevue) to register. This is a 3 hour class, beginning at 12:30 pm; $24 class fee. Reminder: The holidays will be here before we know it – order your special dresses now for the many parties and pictures! November 9th I will be presenting a class, the “Mama Mia” bag, at the Pacific Fabrics Bellevue store. 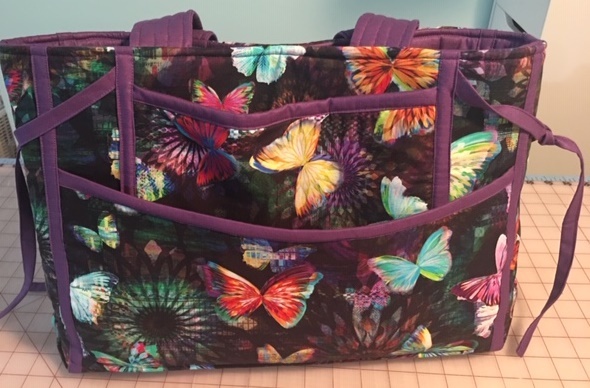 This roomy tote features four pockets inside and four on the outside — plenty of space to store all your special items. Make this in one all-day class as a gift or a great accessory to your busy schedule. Class time includes a lunch break. Visit Pacific Fabrics (Select Classes and Bellevue) to register. This is a 6 hour class, beginning at 10:30 am; $48. On November 10th, Don Jensen of “Affordable Sewing Machine Service” will be here. He will demonstrate proper procedures on maintenance and service of your sewing machine. Bring your machine for cleaning and bring a list any problems you may be experiencing. Don't forget the foot pedal or power cord! The class will be from 10-1 pm; fee of $10 each. As space is limited call, email or register online. An afternoon session will be added depending on interest. Gear up for the holiday shopping season with crafts, gifts, food, live entertainment, holiday music, kids crafts, and lots of fun for the whole family! Once again I will have a booth at the A Festival of Crafts & Gifts held at the Enumclaw Expo Center on November 16th, 17th & 18th. Friday/Saturday hours are 10-6 pm and Sunday from 10-4 pm. Mark your calendars today! Contact me via phone or email with questions. All items shown are available for purchase (except the sewing machine, of course!). Summer is almost over and school is approaching quickly. With that in mind I have selected two fun projects for September: a darling multi-tiered Skirt and a cute Zipper Bag. Of course, there are a multitude of alternative projects to choose from! 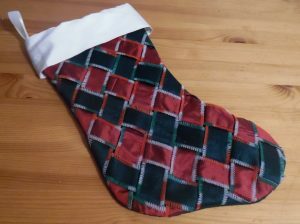 Perhaps you would prefer to create a handy tote bag with lots of pockets, a holiday apron, or a quilt block pillow. I have been long wanting to include a session focused on sewing for those less fortunate. So, beginning in September, the third Thursday evening session (6-9 pm) of each month will be “Sewing 4 Others”. There will not be a fee for this session. I have a range of projects in mind: blankets for NICU’s or PIC in Kent, quilts for Project Linus or Quilts of Valor, pillowcases for foster kids, or blessing bags ~ for starters. Suggestions are welcome, too! If there are requirements or restrictions for a specific project, I will have those available. You may bring your own fabrics and there will be a selection available here. As space is limited call, email or register at old2newheirlooms.com. 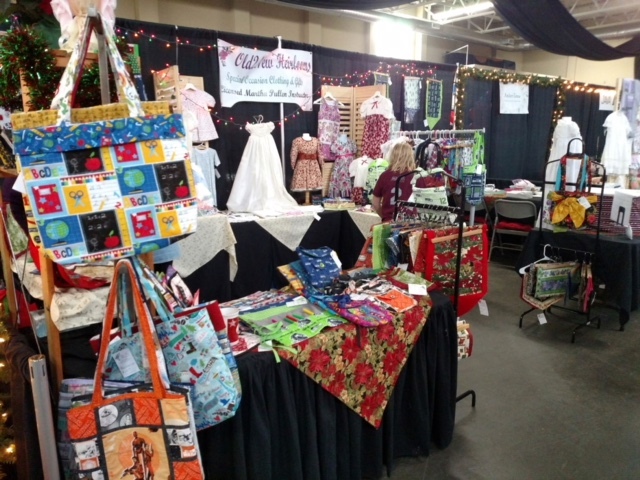 For a second year, I will have a booth at the Quilt Show at the Enumclaw Expo September 28th and 29th, 10 am -4 pm. The majority of my inventory for that show will be fabrics: fat quarters, ½ and 1 yard cuts with a few “made” items mixed in. Presented by the Crystal Quilters of Enumclaw, this is a juried show with an abundance of superb quilts on display, plus an assortment of vendors. Admission is $6; bring a non-perishable food item & receive a fat quarter from Crystal Quilters. The featured Quilter will be Cathy Dormaier. 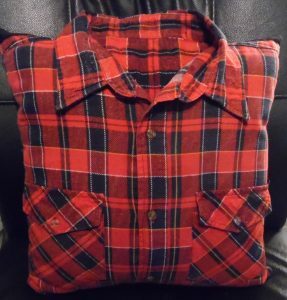 Holiday Gift Idea: a Memory Pillow created from a loved one’s shirt. The pillow itself is made of quality fabrics allowing it to be imminently huggable! Personalization on the back of the pillow includes the name and dates plus a saying or favorite verse. Contact me for further details. I hope everyone had a super fun and safe July 4th holiday. Summer may now officially start! I will be participating in the “Sundays on Cole” event here in Enumclaw, scheduled for 8 Sundays starting July 8th. I will have a booth on 3 of the days: July 15th, August 5th and 26th. Each Sunday will have weekly themes including food trucks, street vendors, a farmers market, car show, and more! Visit downtown Enumclaw, on Cole Street, from 10-6. Mark your calendars for the Kids Sewing 4 Fun Kamp! Bring your friends - mom and dad are welcome to join in on the fun! I have several great projects planned. The Kamp will be held on July 16, 17, and 18 from 9-noon each morning. Snacks and all supplies are included for $125. Please let me know if you will need a classroom machine ~ I only have 3 right now! The calendar on my website is now working! Yippee! You can see at a glance the featured projects for each class, plus any special events I have scheduled. I am working with a local sewing machine repairman for a “Sewing Machine Maintenance Day”. He will demonstrate cleaning and upkeep of your machines and troubleshoot any issues you may have. Once we have the details worked out, I will post the day and time. Check the online calendar, too! Late June Activities . . . Although there was a ribbon cutting a few months after I joined the Enumclaw chamber, it was at the Chamber office. I did not have an "official" storefront at that time. Well, now that I do . . . another ribbon cutting ~ at my new shop! It will be Wednesday, June 20th at 2 pm and everyone is welcome! 😀 Pictures to come . . .
An event promoting local business through an open market in downtown Enumclaw ~ called "Sunday's on Cole" ~ will be every Sunday July 8 to August 26, 10 -6. I will be participating on July 15th, August 5th, and August 26th. There will be food trucks, street vendors, arts & crafts, farmers market, car show, and more! Hope to see you there! 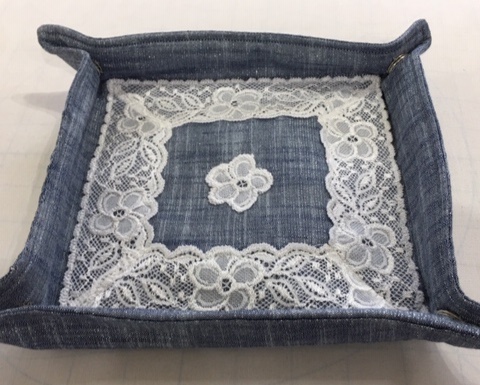 The second project for June is Madeira Scalloped Heirloom Bonnet.July's first featured project will be Pencil Roll-up Cases. Contact me for information on class schedules. The shop is open on Saturday's 10-4 pm for fabrics and gift items. The Open House will be this Sunday June 3rd, 1-5 pm. I look forward to visiting with you and showing off my new workarea and classroom! Although there are a few items still to be done, the updated website is up and running! 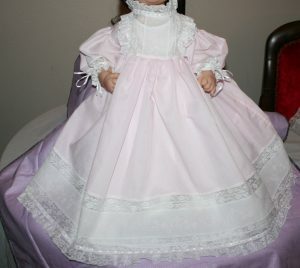 It is mobile compatible, the online shop is working and you can place orders for classes or other items. Now it is up to me to add the rest of my inventory! Coming soon will be a monthly calendar for ease in selecting classes and a gallery of photos. The shop will be open, regardless of class schedule, on Saturdays from 10-4. You can shop a variety of items, from home deco & gifts to fun dresses and christening gowns. I am available for questions or just good conversation! NOTE: The shop will be closed and no classes will be scheduled from June 7th thru 12th. The featured project thru June 16th is the Travel Zipper Roll-up and for the rest of June Madeira Scalloped Heirloom Bonnet. I am interested to know how many would be interested in a Kid's Sewing Camp for later this summer. Projects could include "Shaving Cream Color Blocks" & "Spinner Art Blocks" among others. I am thinking of 3 consecutive mornings (all materials included) for $125. Perhaps in late July or August? Please contact me with your thoughts. Thank you. 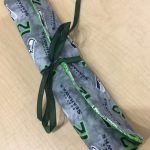 Open House, Featured Project & Classes . . . I just realized last night that this weekend is the Memorial Day holiday! In light of that “uh oh” moment, the Open House has been rescheduled for Sunday June 3rd, 1-5 pm. The featured project for the next two weeks is the “Travel Roll-Up”. Partly prompted by having several kits left over after this last weekend, this project features 3 ways to install a zipper. The rollup can be used for jewelry (perfect for travel), to carry crochet hooks, Legos or even small cars! Reminder: The weekly sessions are . . .
”Mix-It-Up” will be on Wednesday morning (9-noon). This will be an opportunity for students to bring an unfinished project to work on, begin something new, or work on a specific technique. “Let’s Play with our Machines” will be Thursday evening (5-8 pm). Learn the basics of your machine while working on simple projects. 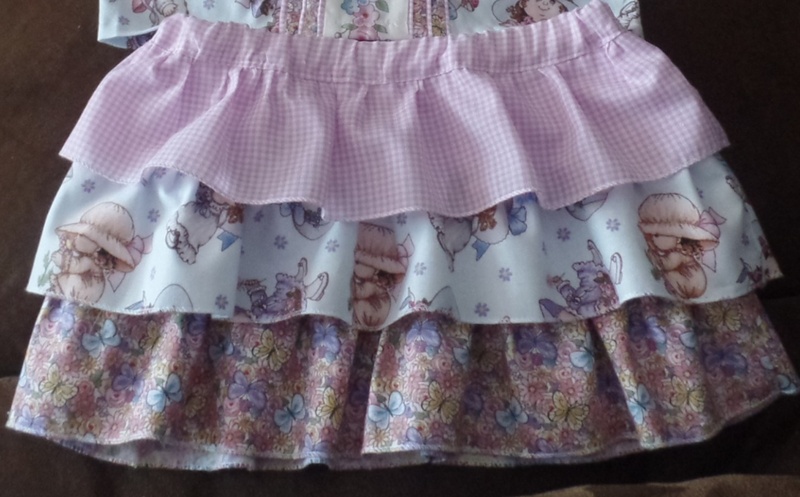 Saturday morning (9-noon) will focus on Kids Sewing. The children will learn a new technique each week and become comfortable with the sewing machines. 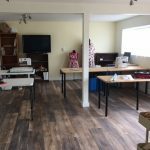 Beginning Sewing will be on Saturday afternoon (1-4 pm). This class will allow students to become more comfortable with their machines and learn new techniques. Each 3-hour class is $35 (plus tax). 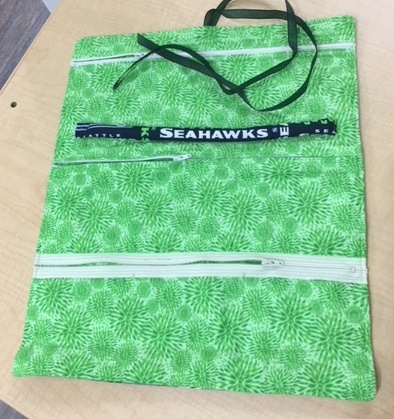 Fabrics and kits may be purchased at time of class or students may bring their own supplies. Until the new version of my website is active, please contact me directly to register. FYI The shop will be closed and there will be no classes on June 7th through June 12th. The classroom is almost ready! 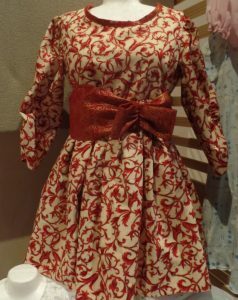 Sewing Classes to begin May 5th! With construction complete, I have been busy organizing fabrics and setting up the classroom. I am SEW excited to start a new chapter in my business!!! 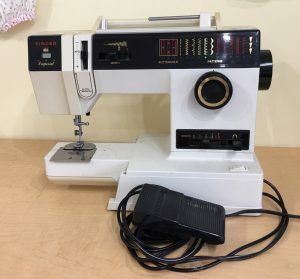 For a long time, it has been my dream to teach sewing. I have many years of experience and training with LOTS of tips and tricks to pass on to others. 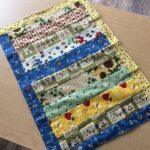 The results complied from an informal survey at events in 2017 show quite a few are interested in both beginning classes and quilting. Based on that, I am offering 2 classes, initially, both this coming Saturday May 5th. Beginning Sewing for Kids (Striped Doll Blanket) 9-noon and Beginning Sewing - Pinwheel Quilt Block 1-4 pm. Check in Products on my website or see my facebook posts for more information on each class. Please contact me directly to register for these two classes: Carolyn at sales@old2newheirlooms.com. I am working on the session offerings (I have lots to choose from!) for the rest of May and beyond; they will be posted once complete. Let me know if you have specific class or project requests. I look forward to guiding you on your sewing journey.